“But if we walk in the light, as he is in the light, we have fellowship with one another, and the blood of Jesus his Son cleanses us from all sin” (1 John 1:7). “And there is salvation in no one else, for there is no other name under heaven given among men by which we must be saved” (Acts 4:12). “(18) … you were ransomed from the futile ways inherited from your forefathers, not with perishable things such as silver or gold, (19) but with the precious blood of Christ, like that of a lamb without blemish or spot” (1 Peter 1:18-19). “And everyone who calls on the name of the Lord will be saved” (Acts 2:21). “For if while we were enemies we were reconciled to God by the death of his Son, much more, now that we are reconciled, shall we be saved by his life” (Romans 5:10). “ For with the heart one believes and is justified, and with the mouth one confesses and is saved” (Romans 10:10). “For by grace are ye saved through faith; and that not of yourselves: it is the gift of God” (Ephesians 2:8, KJV). Yes, Jesus has sav’d even me. Yes, his blood has wash’d whiter than snow. To kingdoms and mansions above. The measureless depths of his grace. And live in his loving embrace. His blood that makes whiter than snow. All of God’s dear children trust in the precious blood of the Lamb of God, which taketh away the sin of the world. They know, … that the blood of Christ is the principal topic of God’s revelation, and the foundation of his great plan of salvation. They know that the expression, “blood of Christ,” somehow stands for sacrifice of Christ, though they are sadly confused by false ideas on the so-called “trinity,” and consequently upon what our Lord Jesus gave as the sacrifice for sins. There is surely an object in this misrepresentation of the general views of Christian people. Is it to confuse the mind, excite disgust at the thought of blood, and swimming in rivers of blood, etc., and then under the warmth of the denial: “Such is not my belief even if my fathers did believe it,” to point out to the confused one a theory which it is desired to impress? It looks very much that way. The theory then advanced is, that when Christ’s blood is mentioned, the word blood stands for carnal nature, and the understanding should be—Christ slew HIS carnal nature, as an example of how all his followers and the world in general should slay their carnal natures. Ah! no wonder that, with such a theory to advance, the great Adversary first tried to excite disgust for any and every thing connected with “the blood.” He well knew that, unless disgust for “the blood” should be aroused and form a barrier of mental prejudice, some of God’s children would be sure to examine the forty-three places where the Scriptures mention the blood of Christ, and the many more where they mention the blood of animals which typified his blood. And if they would but investigate, they would find that which would prove fatal to the theory he wished to establish as new light. The few who look to God’s word for instruction find that in these forty-three times that the blood of Christ is mentioned, neither our Lord nor the apostles once hint that the blood of Jesus represented the slaying of his carnal nature, nor that he had in or about him anything evil that required to be destroyed. They find, on the contrary, that there was no cause of death found in him except in the sight of the hypocritical Pharisees. And they find that, to the contrary of the theory we are criticizing, these forty-three inspired testimonies on the subject declare unitedly, not that our Lord shed his blood for himself and as an example to all men to shed their blood for themselves and thus reach perfection, but that, whatever blood symbolizes, it is his blood that cleanseth us from all sin. Yes, his blood became the basis for the forgiveness of our sins, made peace for us, opened up the way to reconciliation, and transferred us from the domain of sentenced culprits, back to sonship in the family of God. So says the great Apostle Paul—Col. 1:20; Heb. 9:12; 10:19; 13:12; Rom. 3:25; 5:9; Eph. 1:7; 2:13; Col. 1:14 and Acts 20:28-31. So declares the great Apostle Peter—1 Pet. 1:2,19. So testifies the beloved Apostle John—1 John 1:7; Rev. 1:5; 5:9; 7:14. Truly the Word of God is sufficient that the man of God may be thoroughly furnished against all the wiles, glosses and sophistries of Satan. Even those who do not see clearly what the blood does signify or symbolize, can, without aid, quickly see that it means nothing at all like what this erroneous view would set forth. The idea of the blood of Christ signifying the slaying by him of his carnal nature is as far from the testimony of the above passages of God’s Word as the East is from the West. But what is the true significance of the blood of Christ when used in reference to our cleansing from sin, as in the above citations? If it does not mean literal blood, what does it mean? We answer by giving God’s definition of what blood represents or symbolizes. The blood is the life. (Gen. 9:4-6.) “For the life of the flesh is in the blood; and I have appointed it to you upon the altar to make an atonement for your souls [lives, beings]: for it is the blood [sacrificed life] that maketh atonement for the soul [or being].”—Lev. 17:11,14. By accepting God’s definition of what blood signified, in all the sacrifices, as well as in the case of the “one sacrifice for all” which our Lord Jesus presented, all confusion disappears. As blood represents the life, the shedding of blood represents the loss of life—death. So then, the expressions—the Lamb slain, the cleansing blood of the Lamb, the precious blood of Christ, no more refer to literal blood than to a literal lamb, but to the death of Christ. True, our Lord’s side was actually pierced and blood flowed out, but the expression, “He hath redeemed us by his blood” (by his death), would have been equally true and proper, if not a drop of his literal blood had passed from his veins; for it merely signifies that he redeemed us by his death—by the sacrifice or loss of his life. Thus it is written, “He poured out his soul [being—life] unto death;” and again that he made “his soul [being—life] an offering for sin.”—Isa. 53:12,10. So then, God’s people have always had the pith of the truth on this subject, when believing that the “blood of Christ” meant the sacrifice of Christ. That is the correct thought. 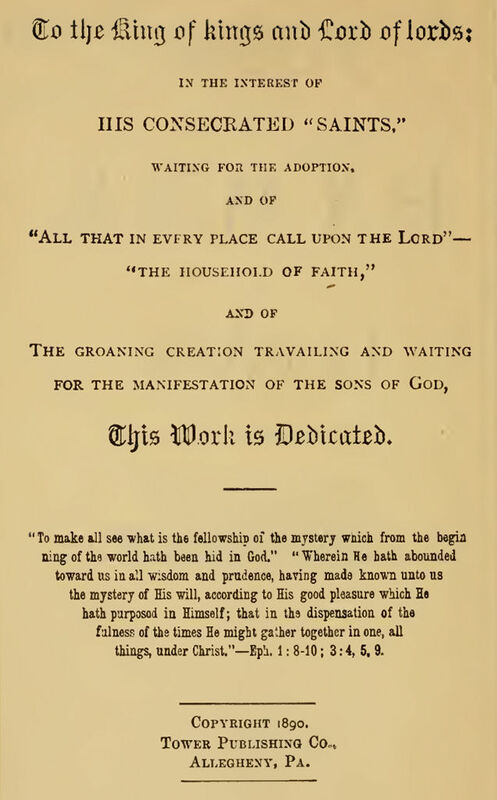 Their difficulty is, that when they come in contact with errors their lack of a clear understanding of what sacrifice Christ did make for the sins of the world, combined with erroneous ideas of a trinity, make them liable to be led astray from the foundation doctrine of Christianity—”that Christ died for our sins according to the Scriptures.” Finding that they cannot clearly analyze their own views, they are very susceptible to the false view we criticize, which first ridicules the idea which no one holds, that it is the literal blood of Christ which washes away our sins, and then offers the proposition, that Christ’s blood, when referred to in Scriptures, represents his slaying of his own carnal nature and desires, as an example to men, how they must each slay his own carnal nature and desires. According to this unscriptural theory each man would be his own Savior. And not only so, but if each would be a great Savior in proportion to the work accomplished, then the Lord Jesus would be the least of all; because, even those who claim that he had a carnal nature to crucify or slay cannot dispute that many men have far more of evil and sin working in their members to overcome than our Lord had. And if each slays sin in himself, the more degraded the man the greater the salvation, and the greater he is as his own Savior. But let each compare this view briefly with the view presented in the above cited statements of the apostles respecting the blood of Christ—the life which he laid down on our behalf. The life of the world in general was gone—forfeited in father Adam’s failure when on trial—all not absolutely dead were dying. They were under the execution of the just sentence of God, “Dust thou art and unto dust shalt thou return.” God had decreed a sentence which would most fully manifest the law of the universe—that no sinner shall live—and one which at the same time furnished an opportunity for revealing to angels and to men his unswerving justice, his great love, and his boundless wisdom and power. When God decreed death as the penalty for sin, so that a ransom (a corresponding price—a just one to die for [or instead of] the unjust one—Rom. 5:17) would be necessary to the release of mankind from the sentence, he did so in full view of the course he would pursue. His wisdom foresaw the results of leaving Adam to his own free will—that in his inexperience he would not submit his will to the will of his creator and would therefore get into sin and under the sentence of death—extinction. And his wisdom also foresaw how his love could work out a plan for the salvation of his creatures. And he foresaw that the well beloved and only begotten Son would humbly consent to carry out the divine plan—to leave the glory and honor of the heavenly nature, and as the man Christ Jesus give himself a ransom for Adam and his race.—Phil. 2:7,8; 1 Tim. 2:5,6. Since the penalty was death, the ransom necessary to release the dead and dying world from the sentence under which all were, and to secure them restitution—resurrection—and an individual trial for everlasting life, was the death of this perfect man whom God thus provided. And this simple and easily comprehended plan was carried out. The man Christ Jesus gave himself a ransom for all;—he died, the just for the unjust;—he died for our sins. The dying on the cross, the drops of bloody sweat in Gethsemane, the pierced hands and side and flowing blood were not necessary to our ransom. None of these things were the penalties of sin. God’s sentence against Adam—”dying thou shalt die”—did not specify what manner of death, nor what amount of suffering should be connected with it. Death alone was the penalty, and had God’s will been such, for our Lord to have met death in any other form than crucifixion would have been equally our ransom price. Many do not see that in our Lord two things were being accomplished at once. Our ransom was being provided, and  our Lord’s extreme fidelity to the Heavenly Father was being tested and proved in the same sacrifice. As our ransom, death in any form would do; but as an unbounded proof of his humility and obedience to the Father’s plan, the shame of the cross was added.—Phil. 2:7,8. The result of his death as it affects himself is that he is now highly exalted and made partaker of the divine nature, that all men should honor the Son even as they honor the Father.—Phil. 2:8,9; John 5:23. The result of his death as it affects mankind is that it places the world in his hands as the purchaser, to the intent that, without violating the law and sentence of God (which he satisfied with his own [life] blood), he may restore men to perfection and offer everlasting life to all who will come into harmony with God’s perfect law through him—under his direction and assistance. Thus we are justified by his blood [by the life which he laid down for us]: our sins and imperfections are passed over, forgiven, covered by the merit of the ransom which he gave. Not only sins past and present, but also all future sins—all that are directly or indirectly the results of Adam’s transgression—all that are not our own, that our wills do not approve of, are not reckoned any longer to those who are in Christ Jesus. No wonder these have joy and peace as they realize that there is now no longer any condemnation against them.—Rom. 5:1; 8:1. Here begins the work of sacrifice and crucifixion with Christ to which many are invited, but to which few respond. It is a mistake, however, to consider this sacrificing as a slaughter of our sins or as having anything to do with the “slaying of the enmity” mentioned by the Apostle. On the contrary (under the Law, which was typical), no sacrifice could be offered unto the Lord that had any blemish or imperfection—blemishes representing sin. So it is that no one is ever invited to become a sacrificer with Christ until he has first been justified from all things—cleansed from all sins—by the precious blood [sacrificed life] of Christ. And if these who are cleansed from sins—justified from all things—are told that they may present their bodies [“holy and acceptable unto God” through Jesus Christ] as living sacrifices, it must be their justified selves and not their sins that they present, and that the Lord proposes to accept. The “enmity” which the Apostle declares Christ abolished (Eph. 2:15) was not sin in himself, nor anything in himself; but in or by the sacrifice of his flesh, the man Christ Jesus abolished the enmity or opposition of the Jewish Law Covenant, under which fleshly Israel labored. When that Covenant which they could not keep was fulfilled by our Lord Jesus and passed away (Col. 2:14), all who had been under it were released from its requirements of absolute perfection which opposed and condemned them all, that they might receive through Christ forgiveness of sins—through faith in his blood. The privilege of becoming joint-sacrifices with Christ is limited, as truly as is the privilege of becoming joint-heirs with him. “Now is the acceptable time.” Both the privilege and the reward of sacrifice will end with this age. Now is the time when God will accept the living sacrifices of all who (after being justified from all sin by the blood of Christ) come unto God through him. Such are not invited to sacrifice for their own sins, then, for their sins must be canceled before any sacrifice would be acceptable. But they are invited to sacrifice time, talent, influence, self-ease, and lawful self-gratification, in the service of the truth—in the general cause of God against the great enemy, Sin, and for the recovery of sinners out of it through Christ Jesus. The sufferings of Christ, to a share in which all believers cleansed by his blood were invited during the Gospel age, will soon end. They will be filled up or completed. (Col. 1:24.) Then the glory will follow—the glory of Christ Jesus and also of all the members of his body, the church, those who suffered for the truth (not for their sins), sacrificing their justified selves with him and in the cause of God. Then the reign of righteousness will begin and none will have occasion to lay down his life for the truth’s sake thereafter. Many have believed in the precious blood and have had joy and peace in believing and then heard the call to the privilege of self-sacrifice with Christ; but few have responded, and hence few are chosen to be with him and behold and share his glory and his throne, and his new nature—the divine nature—far above both the human and the angelic natures, even in their grandest perfections. Let us, acceptable to God through the precious blood, make our calling and election sure.Let us lay aside every weight and hindrance and run with patience the race of self-denial to the end—looking unto Jesus, the author of our faith, to finish it by receiving us to the heavenly mansion. Br. Charles Taze Russell — the founder of the Bible Students movement, who is the compiler of “Poems and Hymns of Millennial Dawn” which was published in Allegheny, Pa., in 1890. This Bible Students’ devotional originally contained a total of 151 poems and 333 hymns. Later on, the hymns from this book formed a basis for the hymnal titled ““Hymns of Dawn” which was published by the Dawn Bible Students Association in East Rutherford, New Jersey (USA) and the 1999 edition contains a total of 361 hymns. “2 Set your minds on things that are above, not on things that are on earth. 3 For you have died, and your life is hidden with Christ in God” (Colossians 3:2-3). “8 We are afflicted in every way, but not crushed; perplexed, but not driven to despair; 9 persecuted, but not forsaken; struck down, but not destroyed; 10 always carrying in the body the death of Jesus, so that the life of Jesus may also be manifested in our bodies. 11 For we who live are always being given over to death for Jesus’ sake, so that the life of Jesus also may be manifested in our mortal flesh” (2 Corinthians 4:8-11, ESV). Our strength, our being give. Has to us ever brought. Of life, we shall not know. In glory like his own. And in his light abide.